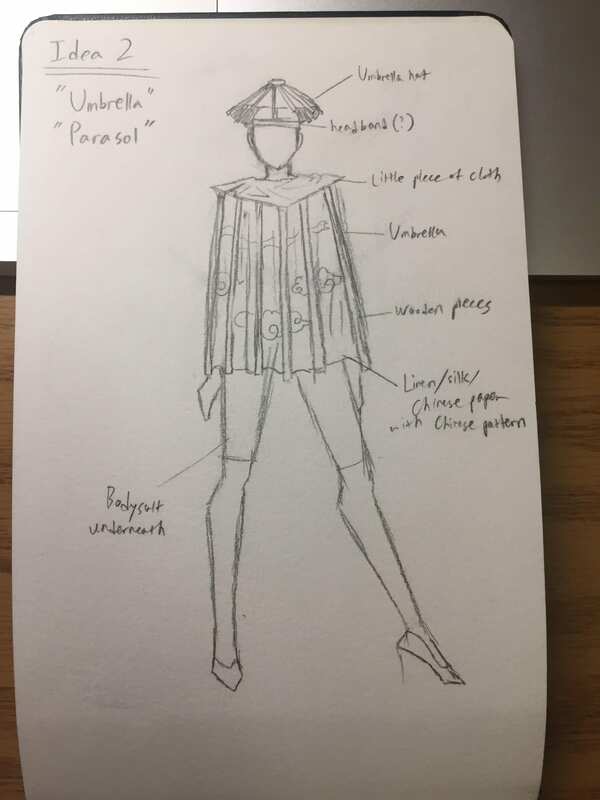 My first concept for my theme–shelter–consists of a person wearing a headset with a miniature parasol on top paired with a a larger sized parasol attached on her arms and neck area. In a neutral position, the main bigger parsol would sink down, but when she raises her arms, the parasol will open up. She is also sporting a bodysuit of sorts underneath. 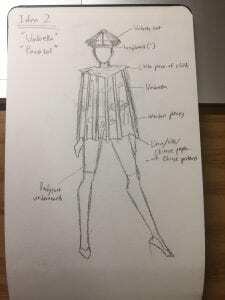 I was inspired for this garment when I was walking through Chinatown today and witnessed shops selling parasols, along with other trinkets, that would’ve provided excellent protection from the element of the scorching weather and sunlight, as well as shade not only to the wearer but potentially for another person or two who can seek refuge underneath the outstretched parasol. The parasols were often depicted as symbols of high socioeconomic status and/or grand events like weddings, thus this garment will adapt to Chinatown because it not only represents the responsibility of people with power to help and guide those less powerful, but also a celebration of foreign cultures interacting and merging together as a community. 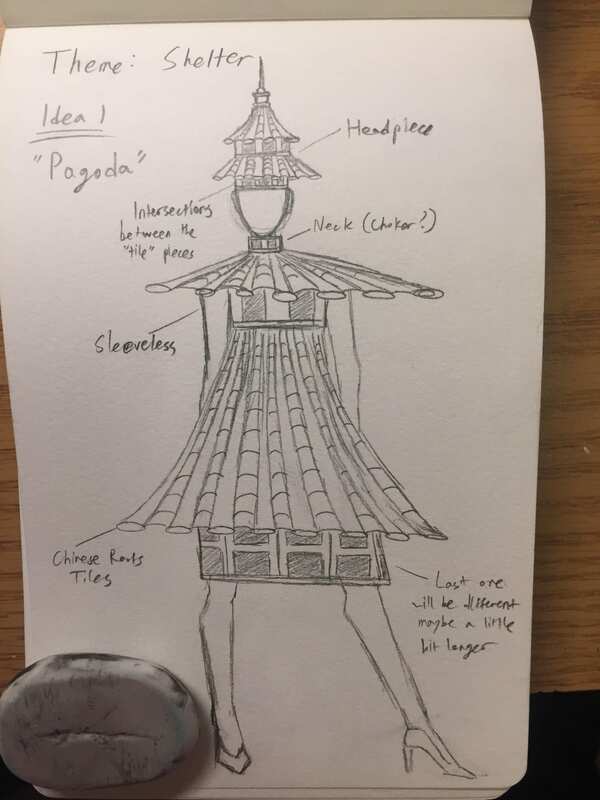 My second concept is of a person ‘s transformation into literally a human shelter sporting the appearance of a Chinese pagoda. 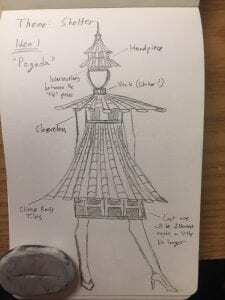 The wearer sports a headset with the tip and tile roof of a pagoda, the neck potentially the intersection part, a wide roof stretching out over the shoulder, and the rest of the dress as roof tiles again. My main inspiration for this concept were some of the buildings in Chinatown that I observed to have the traditional Chinese roofs that assimilates into the Western architecture but at the same time clashes with the different culture and style. Another idea for this was to incorporate the “Protection from Elements” aspect as well by making the roofs much wider to provide an effective shelter both for the wearer and other people. This garment will adapt to the Chinatown environment because it will be able to effectively camouflage into the wide array of buildings that still keep the traditional Chinese architectural style.